Remember the show “Kids Say the Darndest Things” with Art Linkletter? I stumbled upon some of the darndest things that my four kids said growing up. Since Father’s Day was this month, I thought it would be fun to share with all of you fellow parents. 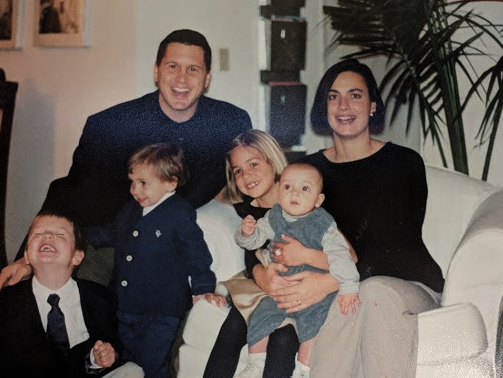 My wife, Tanja, and I, with our four kids: Hayden, Tate, Kayla, and Dexter circa 2000. I have four kids: Kayla, 26; Hayden, 24; Tate, 21; and Dexter, 20. I wasn’t the greatest at keeping track of all the things my kids did. I probably should have recorded more events and taken more pictures, but one of the things I was good at was writing down funny sayings they said. I’ve included some memorable quotes below. My uncle shared a cool idea with me. He suggested recording my kids once a year for 30 seconds each time. Over the years I filmed each of my children at different ages. I started this when Kayla was 6 and Dexter was less than a year old. I chose a spot for them to stand in the yard and would signal them when I was about to start the camera. They could do or say anything they wanted in those 30 seconds. During that time, I would remain quiet, and if there were others present they also had to remain silent. Do you know what kind of pressure that is for a kid, to fill 30 seconds of video with a few people standing there watching them? Some years were easy and they talked the whole 30 seconds. Other years, the 30 seconds featured a kid standing there mad about having to do this. Sometimes, they would just stand there and cry. Whatever they did, we captured it on video and it is precious. As I write this, I wonder why I ever stopped doing this. You could do it for a lifetime! At 100 years old, the video could be watched in 50 minutes. Wow, that would be something to watch. I am going to start it back up and I encourage you to do the same with your family. • Two-year-old Kayla once looked into my eyes and asked, “Dad, why do you have cracks in your eyes?” referring to the red blood vessels in my eyes. • At about the same age, Kayla had gotten up from bed to go the bathroom and Mom was helping her. Kayla asked, “Mom, why is Dad watching TV with a spoon?” I was caught eating ice cream and she could hear the spoon scraping the bowl. • Once during dinner, when Hayden was 4 and Kayla was 6, Hayden was only drinking a Coca Cola because he had eaten earlier. Kayla told him to take off his hat. Hayden said, “I am only drinking.” I guess you don’t have to remove your hat at the table if you are only drinking something. • Around the same age, Dexter told us a story about his dream in which he was being chased by a dinosaur. Right as the dinosaur was going to eat him, Dexter would look up and say, “I love you.” And the dinosaur would go away. • When Dexter was 8, we had a deaf-mute man named Steve who worked for us at our store. Dexter asked Mom, “If you are deaf, can you hear anything?” Mom told him that you couldn’t. A little while later Dexter came back and told Mom, “You are right. I went behind Steve and said, ‘You idiot!’ And he didn’t hear me.” Nice choice of words to test the theory if Steve could hear him!